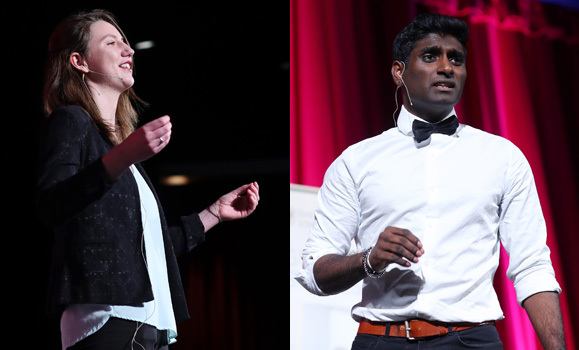 Wednesday night (March 13), 10 of Dal’s outstanding graduate students put on an amazing performance at Dal’s annual 3 Minutes Thesis (3MT) competition. In three minute presentations, they showed how their research projects could influence the future, improve the present, and unravel the past. 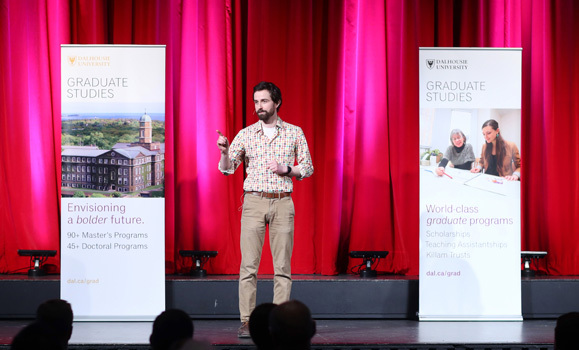 Since its inception in 2008 at Queensland University in Australia, the 3MT has become a tradition in over 600 universities across 65 countries, including Dalhousie. This year, over 90 graduate students participated in the preliminary heats, held the previous day, with 10 finalists selected to compete in the finals. The competitors represented diverse disciplines — from science to engineering to arts. Brett Ruskin, CBC News Network reporter and journalist, returned for the second time to host the event which drew more than 250 people to the SUB’s McInnes Room. The three judges were Dal alumna Kristan Hines, vice-president of public affairs at communications firm NATIONAL; Ivan Joseph, vice-provost of student affairs; and Adam Robertson, interim registrar. When all was said and done, the judges selected Adrian Herod, a PhD candidate in the Department of Microbiology and Immunology, as the top performer. He received a $2,000 scholarship and a paid trip to the Eastern Regional finals in Montreal, as well as his name inscribed on the 3MT plaque which hangs in the main office of the Faculty of Graduate Studies. Winner Adrian Herod on stage in the McInnes Room. Adrian’s presentation, Salmonella: We’ll Infect You if You Lettuce, proposed a possible solution to the issue of foodborne illness and food waste that arises from food contamination with salmonella. Adrian explained that current diagnostic tools are unable to differentiate harmful salmonella strains from unharmful strains — meaning a lot of unaffected foods are wasted. His project is focused on exploring the genome of infectious salmonella and identifying a common biomarker which can be used to distinguish infectious strains from non-infectious strains. Second place went to Baillie Holmes, a MASc candidate in Civil and Resource Engineering, who received a $1000 scholarship for her presentation on causes of harmful algae bloom in Mattatall Lake. Third prize was awarded to Dilshan Weerasinghe, an MA candidate in Musicology, earning $500 for his presentation on the multidisciplinary analysis of Kendrick Lamar’s 2015 album, To Pimp a Butterfly. Second- and third-place presenters Baillie Holmes (left) and Dilshan Weerasinghe. The high quality of the presentations made for a most difficult decision on the judges part — and the audience as well. Those in attendance in the Student Union Building’s McInnes Room also had the opportunity to have their say with the People’s Choice Award. Their choice: Yvonne Brandelli, a PhD candidate in Psychology & Neuroscience, for her presentation on the complexities involved in the treatment of pediatric rheumatoid arthritis. She received a $500 scholarship. 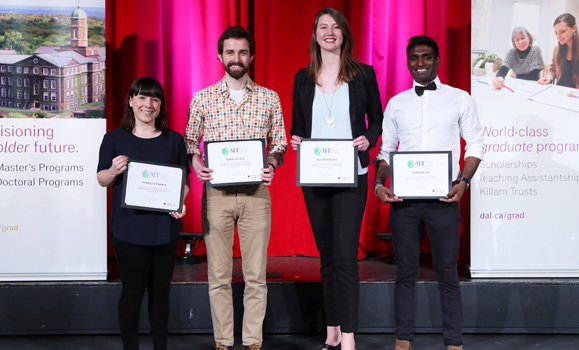 Left-to-right: Dal 3MT award winners Yvonne Brandelli, Adrian Herod, Baillie Holmes and Dilshan Weerasinghe.